The Sitka History museum has acquired three works from Sitka artists for its permanent collections. The purchase of these artworks has been made possible through the generous support of the Rasmuson Foundation Art Acquisition Fund. The Fund, first launched in 2003, was established at Museums Alaska to provide grants to qualified Alaska cultural centers and museums for the collection of contemporary work by living, resident Alaska artists. “By combining art and artifacts in our new museum exhibits, set to open in 2017, the Sitka History Museum strives to support local artists and educate the public about the dynamic and multifaceted nature of interpretations of Sitka’s past,” said the Sitka History Museum’s Curator of Collections and Exhibits, Kristy Griffin. 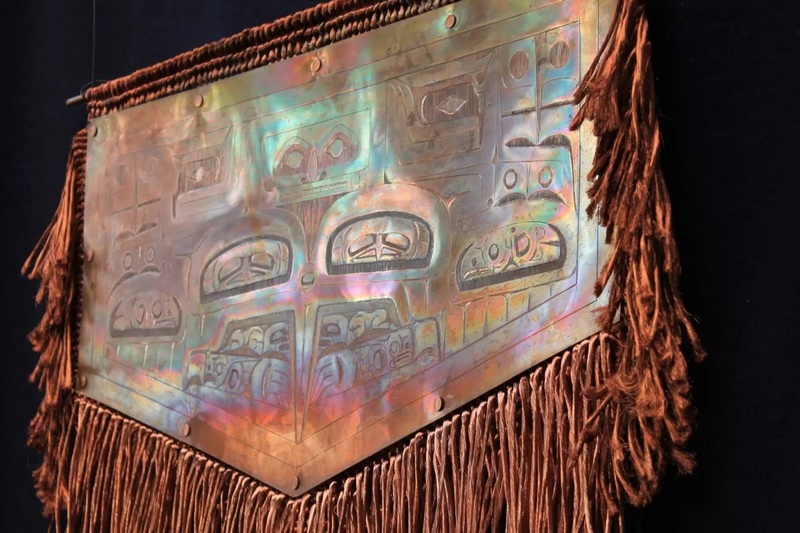 Dave Galanin’s Spirit, a carved copper Chilkat robe, features the creator Raven. Dave Galanin is a renowned Tlingit artist from Southeast Alaska, born into the Eagle Nest House of the Kaagwaantaan Clan. Internationally recognized as a master silver carver, Galanin fuses traditional and contemporary designs to create his own style. With Spirit, Galanin reimagines the woven textile form of the Chilkat robe into copper. Peter Williams’ Shaman Furs Fall/Winter Collection 2016 made its runway debut during New York Fashion Week. This sea fur ensemble, comprised of four pieces from the collection, features a seal and sea otter fur pencil skirt , a sea otter scarf, a sea otter headband, and seal fur earrings with painted red glass beads. Under his label Shaman Furs, Williams interweaves the traditional practice of enduring sea fur sewing with haute couture and is the first to reintroduce seal and sea otter fur to high fashion in almost fifty years. Sharon McIndoo’s Tlingit children’s regalia ensemble highlight’s the artist’s exceptional beadwork. Sharon McIndoo/Shawaatgeigei is a Tlingit/Tsimshian artist of the Deisheetaan Clan (Raven/Beaver). McIndoo’s work combines a distinctive approach with the traditional bead design of her elders. While customary Tlingit beadwork favors uniformity in bead size and shape, McIndoo creates dimension in her work by mixing up the sizes and textures of beads to give her pieces a sense of movement and life unique to her creative style. The Sitka History Museum is currently closed, but The Sitka Historical Society Office of the Executive Director will maintain offices open to the public at the Geodetic Survey House (White House) at 210 Seward Street in Sitka, Alaska during the closure. Please call (907) 747-6455 for an appointment. The Sitka Historical Society is a 59 year old organization which operates the Sitka History Museum. The Society’s mission is to preserve and promote the events, stories and artifacts of the human history of Sitka, as part of the Pacific Northwest coast of North America, to inspire, educate and benefit the Public and future generations. The museum has amassed one of the most diverse and largest collections in Sitka comprised of over 8,000 three-dimensional artifacts, several hundred paintings, prints, and examples of fine art, a spectacular collection of nearly 25,000 historic photographs, and more than 100,000 archival documents, all ranging from the 1740s until the present day.